I was invited by Agency.com to speak at one of their ‘brownbag lunches’ and managed to do so on 29 February, 2008. The format is a relaxed one: an external speaker, an ‘open mic’ in terms of topic (I spoke on rich internet applications, underlying data and the challenge of selling in a contracting market) and a group of people all clutching and munching their lunches and throwing in questions. It was a fun and interesting session and I’m grateful to Nick Corston, Agency.com’s Sales and Marketing Director, for the invitation. Last week I provided the keynote for the Adobe Scene 7 and Bazaarvoice ‘best practice seminar’ for retailers. Held at the wonderfully-located Adobe offices in Park Crescent, London, we were treated to good hospitality, excellent facilities and great company – a broad range of retailers and publishers. Chris Poad, Head of eCommerce for Otto UK spoke in his usual engaging style, and had some really thought-inducing questions about how to replicate the notion of “play” and “playfulness” within internet shopping. Justin Crandall, Commercial Director of Bazaarvoice gave a whistle-stop history of ratings and reviews and then proceeded to move quickly beyond the obvious into the future challenges at the heart of “customer to customer marketing”. I learned a good deal from these presentations – and left with a number of new questions to ponder. Marty Cornelius and Ijaz Bhattee of Adobe Scene 7 then treated us to a tour of the capabilities of the imaging platform, made all the more memorable by Ijaz demonstrating live the ‘hackability’ of the Scene7 URLs (instructional parameters) and really showing how one could ‘drive’ the application. I always admire someone with the confidence to do a whole presentation ‘live’! When I was younger, fitter and more devil-may-care I consumed inordinate amount of great coffee and ordinary wine. 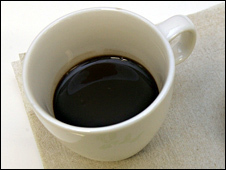 My long-suffering and healthy partner (now wife) would occasionally take me to task (as she witnessed the umpteenth ristretto of the day) and I would reply that it was part of my "balance of toxins" regime: the red wine and caffeine would cancel each other out, leaving me hale and hearty. Every other month we learn that wine in moderation is good for us, but I’ve not seen until now any scientific evidence of the beneficial effects of caffeine. Just as well there’s such a catchy phrase for this benefit – the "blood brain barrier". Sadly, the result has only been seen in (jittery? wired?) rabbits, but I think it’s time I volunteered for the human trials and cranked up my intake from its currently-sensible 3 shots a day. Max. Honest.